Investors in Venezuela are being encouraged to buy bonds in state oil firm Petroleos de Venezuela (PDVSA). Bonds totalling $5bn (£2.5bn) are being issued to pay off debts and finance a huge expansion over the next few years. Venezuela has one of the world's largest reserves of crude oil, but getting to that oil is costly and hence the need for extra funds. PDVSA has pledged to nearly double its output over the next few years and must raise money for the investment. 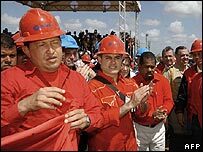 The government is reliant on the income from oil to fund spending on social projects, a key part of the socialist revolution pursued by President Hugo Chavez. The bonds are also being used by the government to try to lower inflation, which is currently running at 20%. With high public spending and strict controls on foreign exchange, there is an excess of the local currency in circulation. Many investors will see this as a good opportunity to convert their savings into the more stable US dollar. They will be able to use the weaker local currency to buy the bonds, which will pay interest and the final repayment in dollars. Order books open on Monday and will close in three days' time, giving investors little time to consider their options. President Chavez has described PDVSA as one of the world's most solid companies, but critics claim the business is being mismanaged and has been used as a political tool.